There’s no one quite like Banksy, is there? Iconoclastic, trail-blazing and always controversial, this camera-shy artist really rules the roost when it comes to street art in the UK. 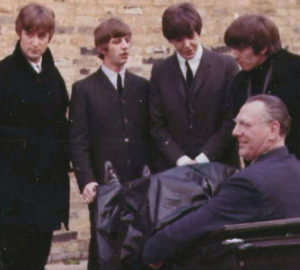 Unfortunately, lots of his best work has been vandalised, painted over or physically removed. But the spirit of street art can’t be killed, and his remaining artwork can be found all over the country, from Dover to Bristol. 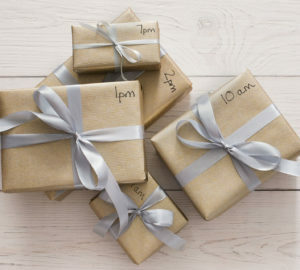 Want to find and photograph one for yourself? 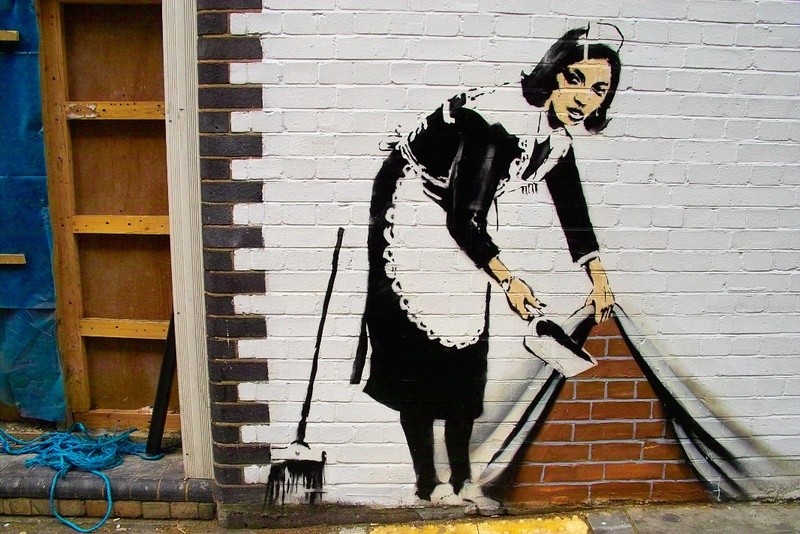 We’ve compiled a list of the best places in the UK to photograph a Banksy, so read on! 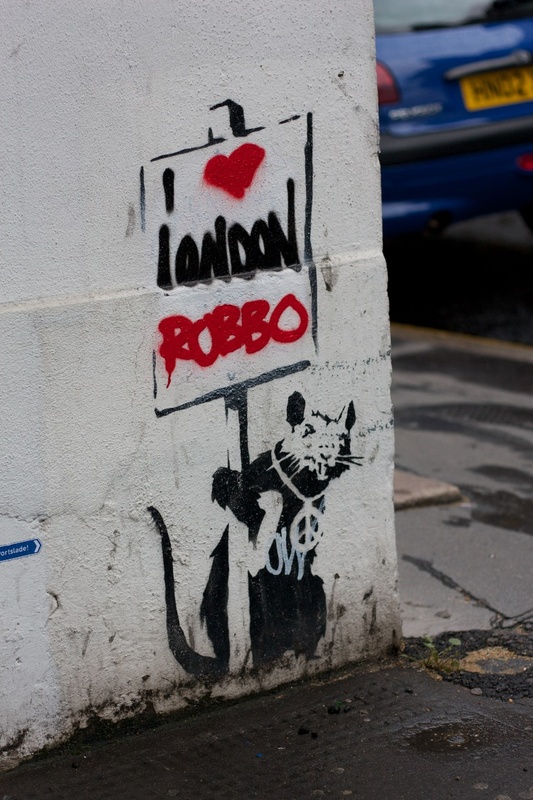 “I Love Robbo” Rat, Chiswell Street: A tribute to fellow graffiti artist King Robbo, this is a certified piece of street art history. Graffiti Area, Shoreditch (Cargo Nightclub): Preserved behind a Perspex sheet, this is one of the best maintained Banksy artworks in the capital. 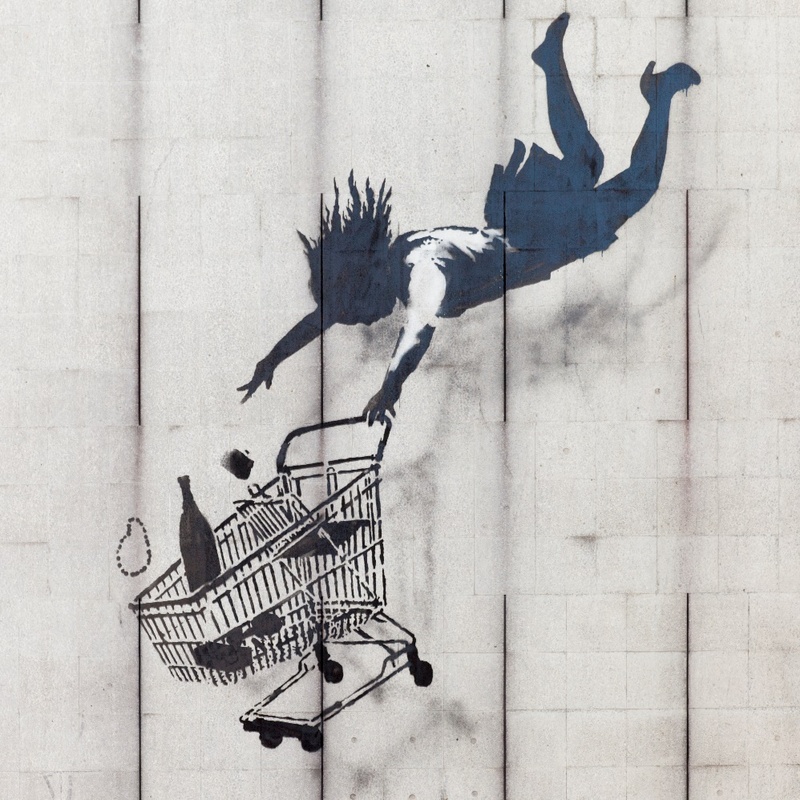 Falling Shopper, Bruton Street: A protest against the perils of consumerism, this mural stands a few storeys above street level. Impressive! Clown House, Stoke Newington: Used on the cover of Blur’s ‘Crazy Beat,’ this one’s a little worse for wear, but still looks great. 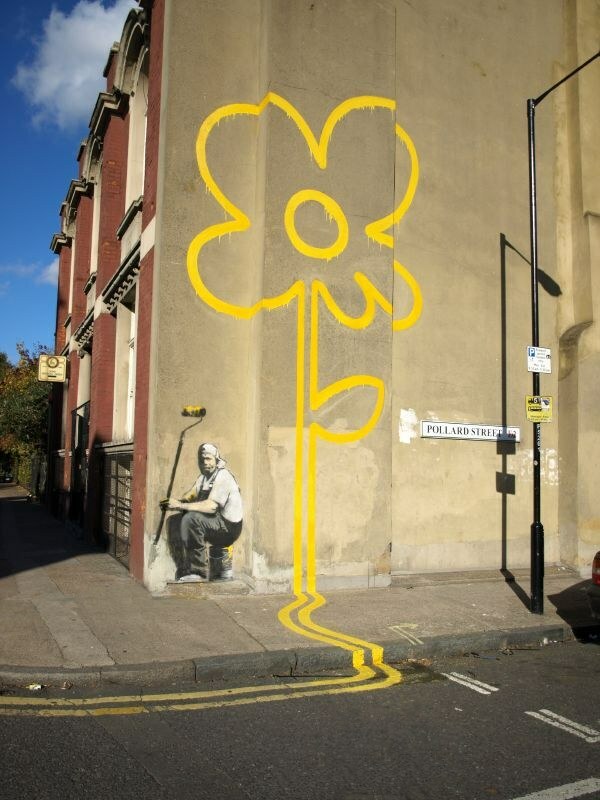 Yellow Lines Flower Painter, Pollard Street: Originally painted in 2007 on a Bethnal Green street, this creative depiction of a man painting yellow lines, and then flowers on the wall, has since been heavily defaced, and the original yellow lines of the curb have also been removed. The flower still remains though the accompanying painter has been graffitied over. Phone Tap, Chrisp Street: Banksy’s tribute to the phone hacking scandal, this jokey artwork is a popular fixture of the Poplar market road. 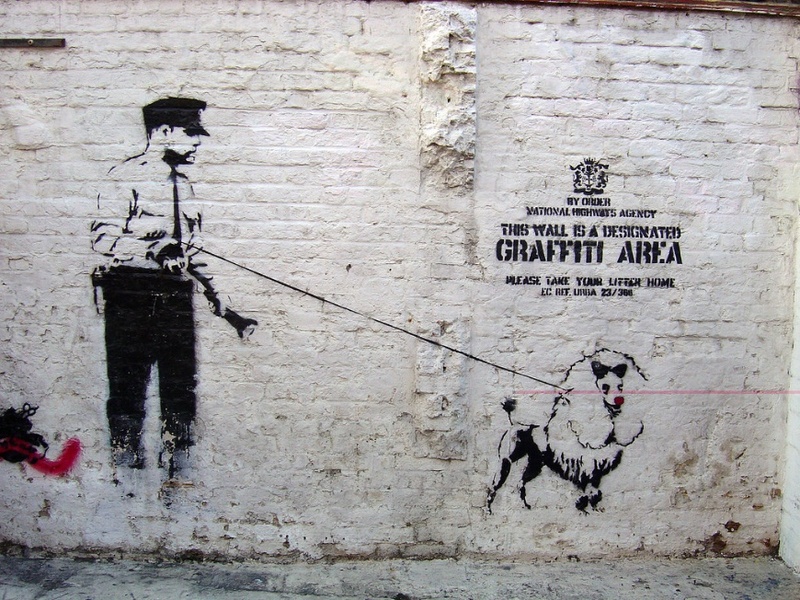 Why not spend a weekend up in London and see how many Banksy originals you can knock off your list There’s around about 12 pieces still dotted around the city, plenty to keep even the keenest Banksy fan satisfied! One of Banksy’s newest artworks is his Brexit mural in Dover. 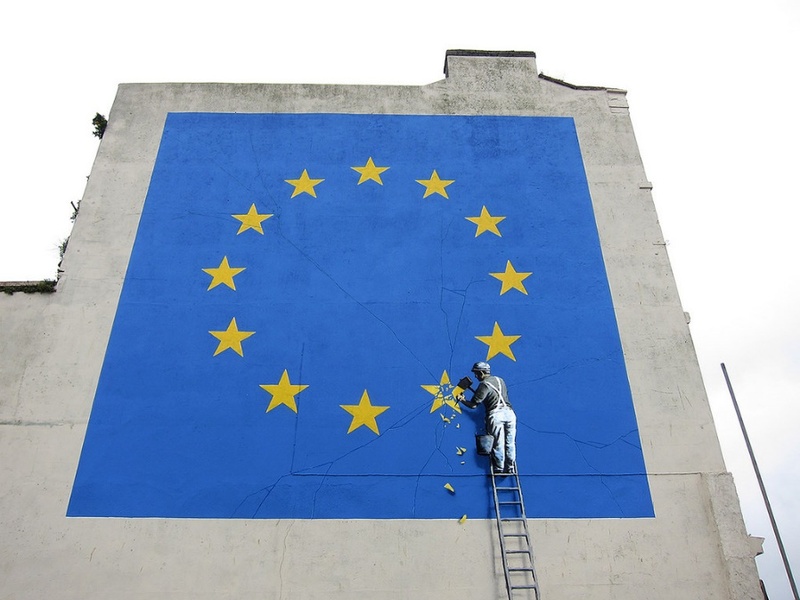 Depicting an EU symbol, the artwork shows one of the stars (the British one) being chipped away by a worker – sending ripples and cracks across the rest of the symbol. The artwork is situated near to Dover’s ferry terminal and appeared around 10 months after the UK’s controversial vote to exit the EU. 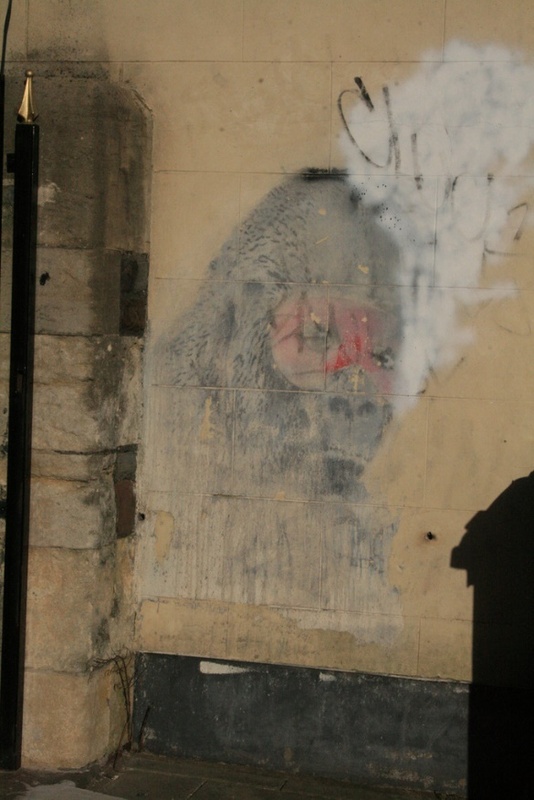 Characteristically political, this piece of Banksy graffiti is well worth photographing. 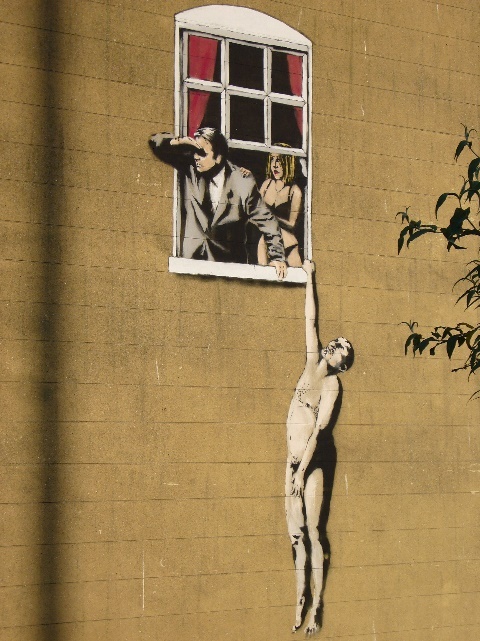 The Well Hung Lover, Frogmore Street: One of Banksy’s most famous artworks, this cheeky piece can be found (oddly enough) on the side of a sexual health clinic. 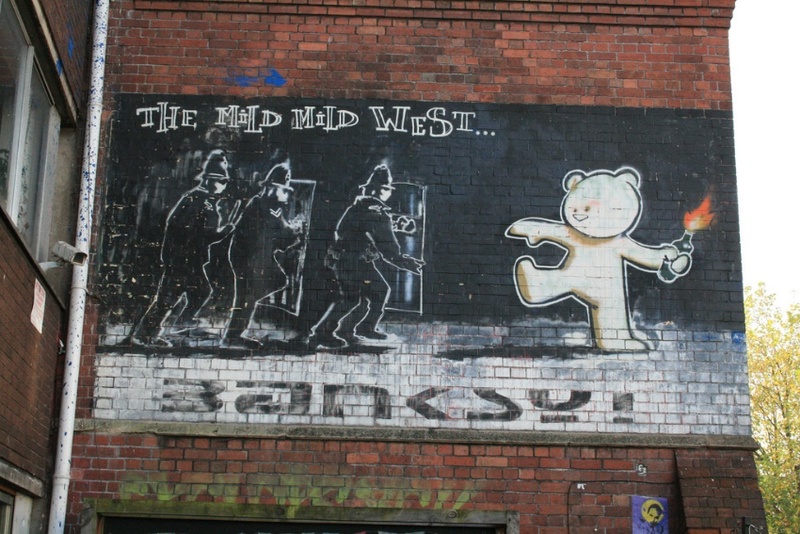 Mild Mild West, Stokes Croft: Satirical, thought-provoking and radical, this is Banksy at his absolute finest. Graffiti Cat and Dog, the corner of Robertson Road and Foster Street: This is one of Banksy’s very earliest street art pieces. It’s surrounded by other artworks, making this a great spot to get a sense of Bristol’s graffiti scene. Masked Gorilla, Fishponds Road: Although it was accidentally destroyed back in 2011, it has since been restored, and looks like a slightly whitewashed version of the original. Still worth a pic, though! Masked Gorilla, Fishponds Road, Bristol. This Banksy classic was accidentally whitewashed over. It’s been restored as much as possible since, though not quite to its former glory. Paint-Pot Angel, Bristol Museum and Art Gallery: Created for the ‘Banksy versus Bristol’ exhibition, this traditional angel sculpture (complete with a paint bucket over its head) is an enduring symbol of his anti-establishment credentials. It’s easy to find and is bound to look great on the Gram. 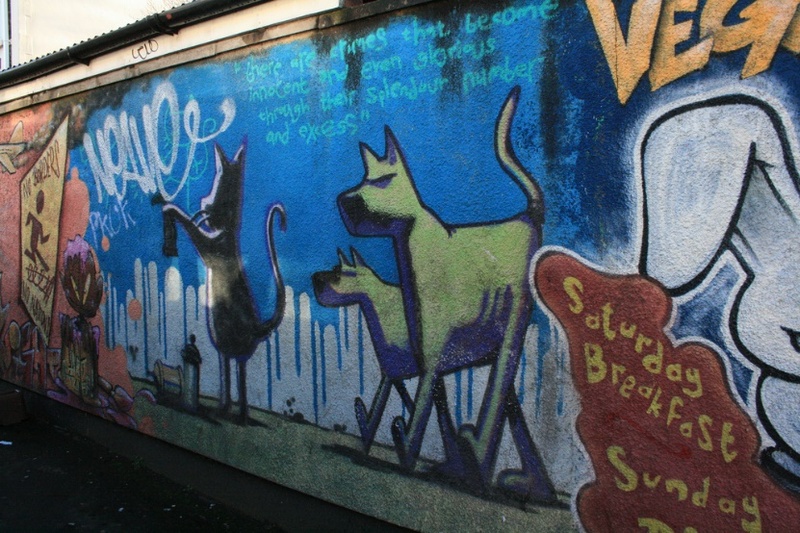 Graffiti Cat and Dog, Foster Street, Bristol, this colourful creation is said to be one of Banksy’s earliest works, before he moved into his signature style. With so many amazing artworks to explore in the area, Bristol is one of the top locations for Banksy-hunters everywhere! Like the look of these pieces? Once you’ve taken your photos, why not print yourself a Banksy poster or, if you enjoy giving your art a practical application, a Banksy photo mug – it’s the perfect way to show your appreciation for one of the UK’s favourite artists! Remember, Banksy’s street art tends to get removed pretty quickly, so the sooner you get out there and start snapping pics, the better your chances of seeing a certified classic!